Our Reach monitor arm has been tested by FIRA (Furniture Industry Research Association) and conforms with BS EN ISO 9241-5:1999 Ergonomic requirements for office work with visual display terminals (VDTs). Workstation layout and postural requirements. The purpose of this standard is to promote and enhance performance and comfort while minimising risks to users’ safety and health. Users of visual display terminals (VDTs) in office work typically adopt a range of postures (seated with leaning, upright or reclining torso, standing or a combination of both). We are pleased to report that Reach successfully completed 50,000 rotations, which is an excellent result. 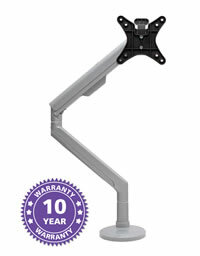 All our Reach spring assisted monitor arms will be supplied with a 10 years extended warranty. If you would like a quote, purchase or discuss our Reach Spring Assisted Monitor Arm, please feel free to contact our dedicated sales team on +44 (0) 1709 385485 or click here to e-mail.